Why Choose The YOUKOYI Architect LED Desk Lamp? Patented LED panel reflects the light sideways and provides a steady,glare free,no-flickering and more natural light source that is friendly for your eyes,less fatigue! Used to turn extraction process like loptop.The lamp holder can adjust 360 degrees angle.The lamp arm can be adjusted up and down 170 degrees.At the bottom can rotate 270 degrees,90 degree angle before and after can be adjusted. Choose from 2 color temperature modes with 8 brightness levels to find the perfect lights to suit your needs.Touch-control system with memory function allows you to adjust light setting with ease. High quality LED chip have a long use time,service life up to 30000 hours,no bulb changing troubles anymore. 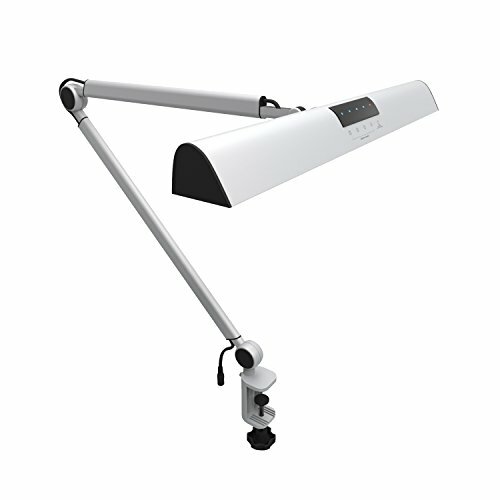 Professional Swing Arm Lamp: Multi-angle adjustable head, rotating swing arm and swiveling LED panel, you can asjust the angle to suit different positions freely. Multiple Color Temperaturse and Brightness: Memory function for 2 color tempertures (warm and white) range from 3000K-6000K and 8-level brightness, up to 700 lumens.Satisfy your different lighting needs. High Quality Material, corrosion resistance. Modern appearance and design, high CRI and give constant caring to your eyes. Touch Control:Touch sensitive switch, easy and convenient to operate. Adjust the brightness and color temperature through 5 touch keys to find your favorite lighting mode. The Clamp Base Design: Strong metal clamp coverd with flannelette can avoid scratches effectively, supports up to 2.36 inches desk. Ideal for architects, drafting, woking, art, workshop, etc.